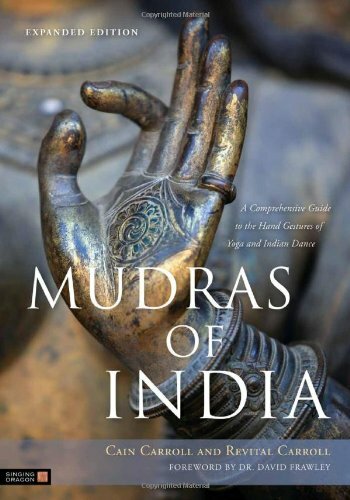 Cain Carroll, "Mudras of India: A Comprehensive Guide to the Hand Gestures of Yoga and Indian Dance"
Includes a key new chapter that comprehensively explains the benefits of hand mudras, covering major health concerns as well spiritual and psycho-energetic categories. For thousands of years hand mudras have been used in India for healing, storytelling, emotional expression, and to evoke and convey elevated spiritual states. 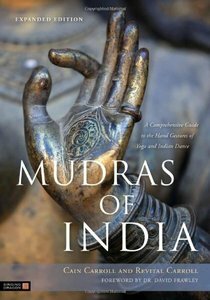 For the first time, the elaborate system of mudras - as applied in yoga and Indian dance-has been organized into a comprehensive, fully-indexed and cross-referenced format that allows readers access to this still esoteric body of knowledge. 'Mudras of India' presents over 200 photographed hand mudras each with detailed instructions on technique, application, health and spiritual benefits and historical background. The authors have extensively researched the usage of mudras and their significance in the larger context of Indian spiritual systems, and taken painstaking efforts to ensure each mudra is rendered with correct Sanskrit name, transliteration and translation to English. The book will appeal to spiritual seekers, students and teachers of yoga and Indian Dance, scholars and lay people, and anyone interested in the rich cultural heritage of Indian mudras, and the transformative effects of these powerful hand gestures.